Praveen Siddannavar's Blog: Window to a Stealth Predator! On 19th May’11 (Thursday) I got a call from my farm in Bandipur, the care taker Nagendra informed me that my German Sheppard Dog - Angel has littered 5 puppies, 3 males and 2 females. I am not a professional dog breeder and had no idea what to do next. I had no option than to call Anandhi our family friend who had gifted me Angel on my birthday and Angel was only 45 days old then (2nd Sept’2009). Upon speaking to Anandhi I got a long list of do’s and don’ts and list of medicines, tonics and multivitamins etc… I had no choice than to travel to Bandipur, for a change I was traveling with some work and not on the usual jungle safari trip. However on the next day (Friday) I had some important meetings to attend coupled with some personal engagements in the evening so the earliest I could leave Bangalore was Saturday morning. 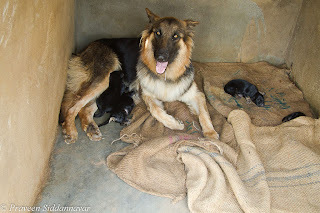 On Saturday I reached the farm by 11:30am and was excited to see the puppies & Angel, fortunately all of them were doing well. The father – Prince (male dog) had no clue what was happening. I handed over the medicines and other stuff that was needed for Angel and her puppies to my care taker, since this was a last minute trip I didn’t get a room at Jungle Lodges and Resorts (JLR). I had no choice than to stay at farm & manage with basic facilities. I am ok with this as long as I get safari rides from JLR. I spoke to JLR & they were kind enough to accommodate me in one their jeeps of course at a cost. I was glad that despite having loads of guests due to summer vacation plus the normal weekend rush, they still agreed to accommodate me. I was waiting for my jeep, suddenly my friend Vinay and his wife Priya arrived at JLR. They had just returned after a week’s stay at Kabini and like me they too didn’t get accommodation at JLR, Bandipur. Hence they had made arrangements for their stay at Forest Hill Farms, Masinagudi ( Tamil Nadu) some 25 kms from Bandipur. Both Vinay and Priya seemed all over the place as their stay was at one end and safari rides with other resorts, but the Nature lovers don’t mind all this as long as they get safari rides. I and Vinay agreed to be in touch via phone & SMS during the jungle safaris, thanks to Airtel that we get signals at some places if not the entire forest. 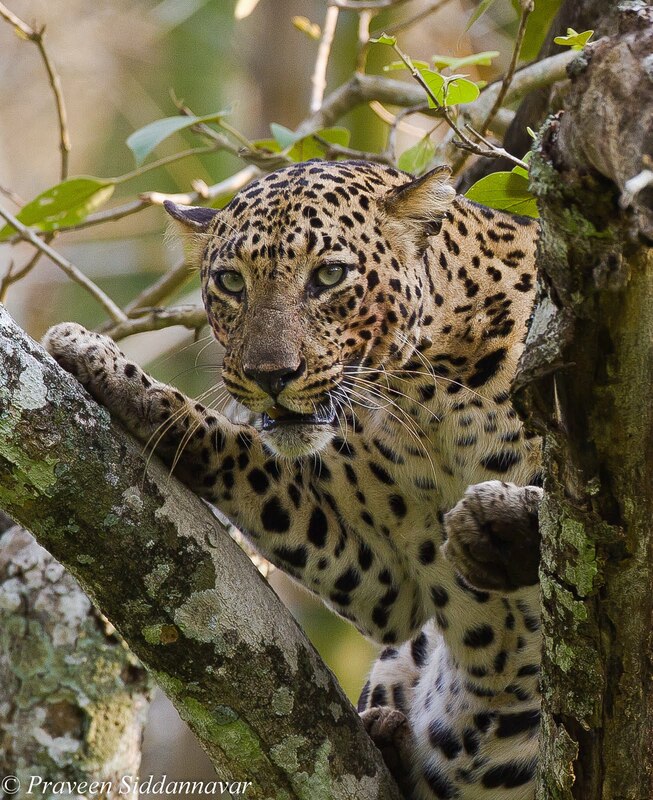 Vinay and Priya are regular visitors to Kabini and have the best collections of Leopard images, by far the best ones in India. They wanted to add few leopards from Bandipur to their kitty. Due to some unavoidable reasons my jeep left late almost 4:45pm, normally I am inside the forest before 4pm. I had Basavanna, Senior Naturalist who was driving the jeep & as usual I took the front seat. Upon asking Basavanna about sightings he said Sir nothing much for past few days, except that a leopard couple (M/F), probably a mating pair had made a kill & was sighted a day before. 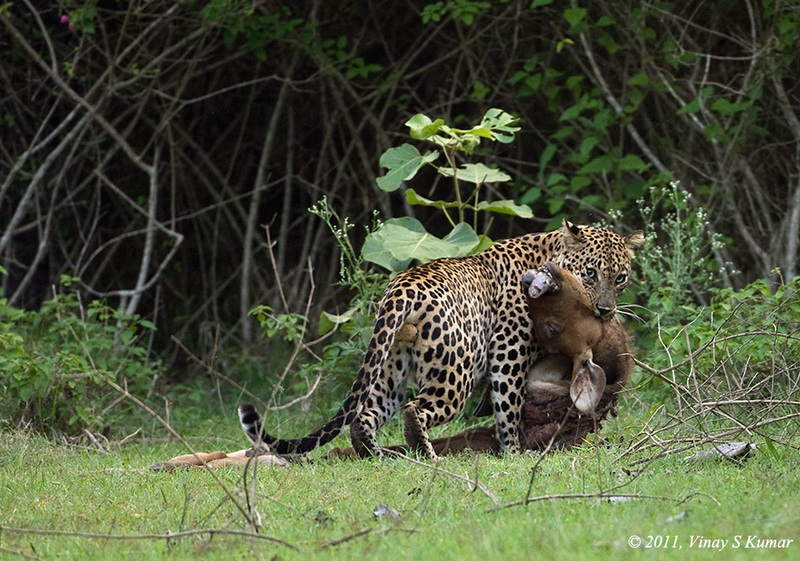 And surprisingly the leopard had killed a calf of a Gaur (Bison) and it was unable to carry the kill up the tree. I can imagine the even calf of a gaur can easily be 3 times the weight of the leopard. As we entered the forest we took the Kare Gowderana Katte road, Basavanna was about to turn right, the route leading to a small water hole. 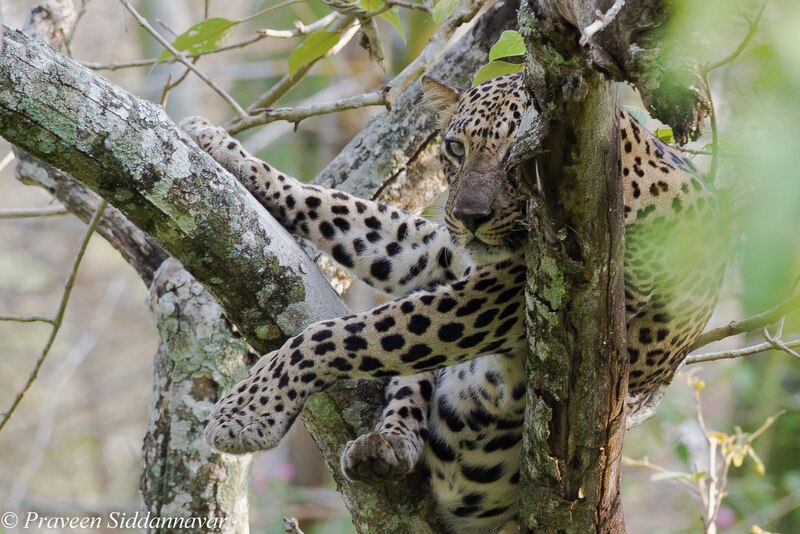 While he was turning suddenly he whispered “Sir Leopard” where I asked him, he replied Sir on the tree. Which tree Basavanna??? Sometimes it is very embarrassing while sighting of Tigers and Leopards, despite them being so close one fails to spot them due to excitement. The guest at the rear had no clue about this, in the meantime I saw it and then we informed them about it and requested everyone to stay calm. Hats off to Basavanna for spotting this beauty, can you believe that this Leopard was fast asleep on the tree when I saw it. Interestingly we had so many jeeps pass by the same route and all of them went unnoticed of this leopard. I quickly made some images of the leopard; it was quite close especially for my 500mm lens hence couldn’t get the leopard in full. As soon the leopard heard noise of our jeep he woke up to check of any threat, by now we got to know that this was the male leopard and also it was the same male that had made a kill. The evidence was the blood stains on the face and whiskers of this leopard. In the meantime I asked Basavanna to call my friend Vinay, he couldn’t reach him. Then I quickly sent him an SMS about the sighting with exact location and fortunately Vinay responded that he is coming. By now few other jeeps saw us & guessed that we had spotted something and drove quickly towards us, leopards are the most shy cats, in no time the leopard decided that he had enough all this non sense so he got down from the tree and disappeared in the under growth. Vinay and Priya reached the spot, but they missed this sighting, we all tried to track the leopard again but couldn’t find him. 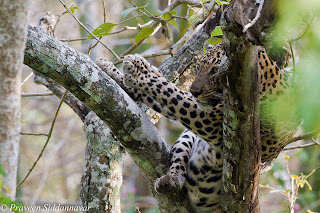 Later we split our routes for spotting other predators and about 6:15pm while returning I asked Basavanna to take us to the same location where we sighted the leopard. 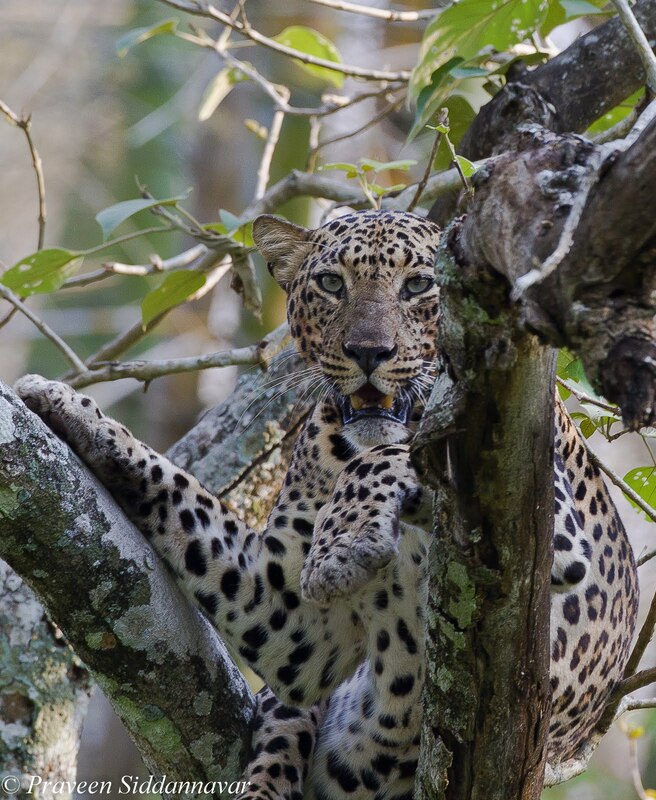 Believe me the same leopard was again resting on a tree and this time much closer to the game track. This time he was more active and in a fraction of a second he jumped of the tree and disappeared. I couldn’t get any photographs this time, as the leopard was really quick. Vinay’s jeep too drove here and missed it again; this is what happens to most of us many a times, missing such sightings by whiskers. The next day Sunday morning we again had very good leopard sighting and this time it was the female leopard, but luck wasn’t with Vinay/Priya, they missed even this by whiskers. When Vinay missed it for the 3rd time, I was wondering & couldn’t believe that how can the luckiest man of leopards be so unlucky today? I said to myself that maybe God has something special for him. Vinay and Priya didn’t give up, I had to return to Bangalore so I headed back by 11am. Vinay decided that he will have one more go at the evening safari and return late night to Bangalore. God really had something special for Vinay and Priya, during the evening safari they not only spotted the male leopard, but were blessed to see and photograph the male leopard carrying the kill that is the calf of the Gaur.